Congratulations to our graduating seniors in the Class of 2012! I could save this post for the end of the exam period, but let me go ahead and post now and include a note of encouragement: You’re almost there! 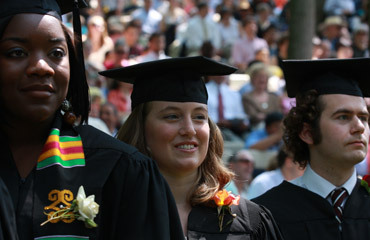 On behalf of all of us in Peace and Conflict Studies, let me further congratulate our seniors of the Class of 2012! Graduating is an important accomplishment. You have worked hard for four years or more, and we appreciate your contributions to the program. Please be sure to stay in touch with us and keep us up to date on your work and accomplishments, professional or otherwise. Your continued involvement will play an important role in the vibrancy of the program in the future!